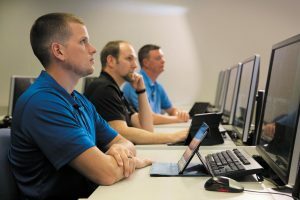 NEW YORK (May 28, 2018) – FlightSafety International announces the ongoing expansion of its EASA Phased Recurrent Training program. It is now available at most FlightSafety locations around the world that provide EASA training including the company’s Farnborough and Paris locations. The program is designed to be compliant with EASA Part-ORO Subpart FC regulation. It consists of two distinct training modules per year over a three-year period. The topics covered during ground school are aligned with the simulator sessions which include a LOFT exercise with at least one airport pairing. This is followed by additional exercises that help to prepare the pilot for his or her LPC and/or OPC. An Upset Prevention and Recovery Training course is provided each year and CAT II, Special Airports, and Right Hand Seat Training programs are also available. FlightSafety also offers an International Training Package for those who operate under EASA. It includes either a 2-day or 3-day recurrent training event with a license/operational proficiency check followed by an operational proficiency check six months later.